Yaroslav I Vladimirovich the Wise Rurik of Kiev was born circa 978 to Vladimir I Svyatoslavich of Kiev (c958-1015) and Rogneda Rogvolodovna of Polotsk (962-1002) and died 20 February 1054 of unspecified causes. He married Nomen nescio . He married Ingegerd Olofsdotter of Sweden (1001-1050) 1019 JL . Ancestors are from Russia, Ukraine, Sweden. Yaroslav I, Grand Prince of Rus', known as Yaroslav the Wise or Iaroslav the Wise (Russian: Яросла́в Му́дрый; Ukrainian: Яросла́в Му́дрий|Jaroslav Mudryj;Old Norse: Jarizleifr Valdamarsson; c. 978 – 20 February 1054) was thrice Prince of Novgorod and Grand Prince of Kiev, uniting the two principalities for a time under his rule. Yaroslav's baptismal name was George (Yuri) after Saint George. A son of Vladimir the Great, the first Christian Prince of Novgorod, Yaroslav acted as vice-regent of Novgorod at the time of his father's death in 1015. Subsequently, his eldest surviving brother, Svyatopolk I of Kiev, killed three of his other brothers and seized power in Kiev. Yaroslav, with the active support of the Novgorodians and the help of Varangian mercenaries, defeated Svyatopolk and became the Grand Prince of Kiev in 1019. Under Yaroslav the codification of legal customs and princely enactments was begun, and this work served as the basis for a law code called the Russkaya Pravda ("Rus Truth [Law]"). During his lengthy reign, Kievan Rus' reached the zenith of its cultural flowering and military power. In his youth, Yaroslav was sent by his father to rule the northern lands around Rostov but was transferred to Veliky Novgorod, as befitted a senior heir to the throne, in 1010. While living there, he founded the town of Yaroslavl on the Volga River. His relations with his father were apparently strained, and grew only worse on the news that Vladimir bequeathed the Kievan throne to his younger son, Boris. In 1014 Yaroslav refused to pay tribute to Kiev and only Vladimir's death, in July 1015, prevented a war. During the next four years Yaroslav waged a complicated and bloody war for Kiev against his half-brother Svyatopolk I of Kiev, who was supported by his father-in-law, king Bolesław I the Brave of Poland. During the course of this struggle, several other brothers (Boris, Gleb, and Svyatoslav) were brutally murdered. The Primary Chronicle accused Svyatopolk of planning those murders, while the saga Eymundar þáttr hrings is often interpreted as recounting the story of Boris' assassination by the Varangians in the service of Yaroslav. However, the victim's name is given there as Burizaf, which is also a name of Bolesław I in the Scandinavian sources. It is thus possible that the Saga tells the story of Yaroslav's struggle against Svyatopolk (whose troops were commanded by the Polish king), and not against Boris. Leaving aside the legitimacy of Yaroslav's claims to the Kievan throne and his postulated guilt in the murder of his brothers, Nestor the Chronicler and later Russian historians often presented him as a model of virtue, styling him "the Wise". A less appealing side of his personality is revealed by his having imprisoned his youngest brother Sudislav for life. Yet another brother, Mstislav of Chernigov, whose distant realm bordered the North Caucasus and the Black Sea, hastened to Kiev and, despite reinforcements led by Yaroslav's brother-in-law King Anund Jacob of Sweden (as Jakun - "blind and dressed in a gold suit"), inflicted a heavy defeat on Yaroslav in 1024. Yaroslav and Mstislav then divided Kievan Rus' between themselves: the area stretching left from the Dnieper River, with the capital at Chernihiv, was ceded to Mstislav until his death in 1036. In his foreign policy, Yaroslav relied on the Scandinavian alliance and attempted to weaken the Byzantine influence on Kiev. In 1030, he reconquered Red Ruthenia from the Poles and concluded an alliance with King Casimir I the Restorer, sealed by the latter's marriage to Yaroslav's sister, Maria. In another successful military raid the same year, he captured Tartu, Estonia and renamed it Yuryev (named after Yuri, Yaroslav's patron saint) and forced the surrounding province of Ugaunnia to pay annual tribute. In 1043, Yaroslav staged a naval raid against Constantinople led by his son Vladimir of Novgorod and general Vyshata (c1030-c1065). Although his navy was defeated in the Rus'–Byzantine War (1043), Yaroslav managed to conclude the war with a favourable treaty and prestigious marriage of his son Vsevolod I of Kiev to the emperor's daughter. It has been suggested that the peace was so advantageous because the Kievans had succeeded in taking a key Byzantine possession in Crimea, Chersonesus. To defend his state from the Pechenegs and other nomadic tribes threatening it from the south he constructed a line of forts, composed of Yuryev, Bohuslav, Kaniv, Korsun-Shevchenkivskyi, and Pereyaslav-Khmelnytsky . 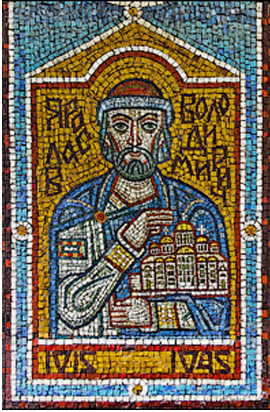 To celebrate his decisive victory over the Pechenegs in 1036 (who thereupon never were a threat to Kiev) he sponsored the construction of the Saint Sophia Cathedral in 1037. That same year there were built monasteries of Saint George and Saint Irene. Some mentioned and other celebrated monuments of his reign such as the Golden Gate of Kiev perished during the Mongol invasion of Rus', but later restored. Eleventh-century fresco of Saint Sophia's Cathedral, Kiev, representing the daughters of Yaroslav I, with Anne of Kiev probably being the youngest. Other daughters were Anastasia of Kiev, wife of Andrew I of Hungary; Elizabeth, wife of Harald Harðráði. Yaroslav had one son from the first marriage Ilya], and six sons from the second marriage. Apprehending the danger that could ensue from divisions between brothers, he exhorted them to live in peace with each other. The eldest of these, Vladimir of Novgorod, best remembered for building the Cathedral of St. Sophia, Novgorod, predeceased his father. Three other sons—Izyaslav I, Svyatoslav II, and Vsevolod I—reigned in Kiev one after another. The youngest children of Yaroslav were Igor Yaroslavich (1036–1060) of Volhynia and Vyacheslav Yaroslavich (1036–1057) of the Principality of Smolensk. About Vyacheslav, there is almost no information. Some documents point out the fact of him having a son, Boris Vyacheslavich, who challenged Vsevolod I sometime in 1077-1078. Following his death, the body of Yaroslav the Wise was entombed in a white marble sarcophagus within Saint Sophia's Cathedral in Kiev. In 1936, the sarcophagus was opened and found to contain the skeletal remains of two individuals, one male and one female. The male was determined to be Yaroslav, however the identity of the female was never established. The sarcophagus was again opened in 1939 and the remains removed for research, not being documented as returned until 1964. Then, in 2009, the sarcophagus was opened and surprisingly found to contain only one skeleton, that of a female. It seems the documents detailing the 1964 reinterment of the remains were falsified to hide the fact that Yaroslav's remains had been lost. Subsequent questioning of individuals involved in the research and reinterment of the remains seems to point to the idea that Yaroslav's remains were purposely hidden prior to the German occupation of Ukraine and then either lost completely or stolen and transported to the United States where many ancient religious artifacts were placed to avoid "mistreatment" by the communists. The ₴2 bill represents Yaroslav. Yaroslav at the Millennium of Russia in Novgorod. ^ a b "Yaroslav I (prince of Kiev) - Britannica Online Encyclopedia". Britannica.com. http://www.britannica.com/EBchecked/topic/652106/Yaroslav-I. Retrieved 2012-04-07. ^ Tvauri, Andres (2012). The Migration Period, Pre-Viking Age, and Viking Age in Estonia. pp. 33, 59, 60. https://www.etis.ee/Portal/Publications/Display/b80b6f11-43ed-4b8c-b616-48ac53b70ec5?language=ENG. Retrieved 27 December 2016. Hynes, Mary Ellen; Mazar, Peter (1993). Companion to the Calendar: A Guide to the Saints and Mysteries of the Christian Calendar. LiturgyTrainingPublications. ISBN 978-1-56854-011-5. https://books.google.com/books?id=n0av-2QejZgC&pg=PA105. Nazarenko, A. V. (2001) (in Russian). Drevniaia Rus’ na mezhdunarodnykh putiakh: mezhdistsiplinarnye ocherki kul’turnykh, torgovykh, politicheskikh sviazei IX-XII vekov. Moscow: Russian History Institute. ISBN 5-7859-0085-8.